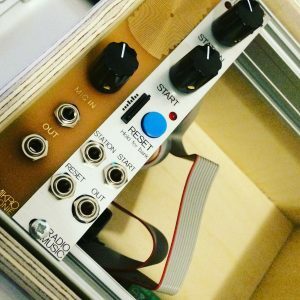 I’ve decided to take the plunge (in a very small way) into the world of Eurorack. Right now, I’m more interested in creating an unusual and unique signal processing chain, than I am in creating a stand-alone synthesiser. My current plan is to try and build every module myself, either from a kit, or hopefully, in the future, from my own designs. I treated myself to a couple of kits from Thonk. A site well worth checking out. I built a Mikrophonie (a contact mic pre-amp) and a Radio Music, a sample player that behaves like a radio, inspired by radio-powered compositions by John Cage and Karlheinz Stockhausen. I had a lot of fun building them, even though I managed to solder some header onto the wrong side of the board (even though the board clearly states which side to use!). This mistake took about 4 hours of tedious desoldering and copious swearing to rectify. Both of these modules were designed by Tom Whitwell from Music Thing. I’ve housed these inside a Doepfer A-100 mini-case. The unfinished wood case is crying out to be screen-printed, but that’s a project for another day! They both worked pretty much first time, which I was fairly surprised and pleased by. I’ll post up some demos when I have some more interesting things to run them through.